Detroit auto show officials formally unveiled their new schedule for 2020. 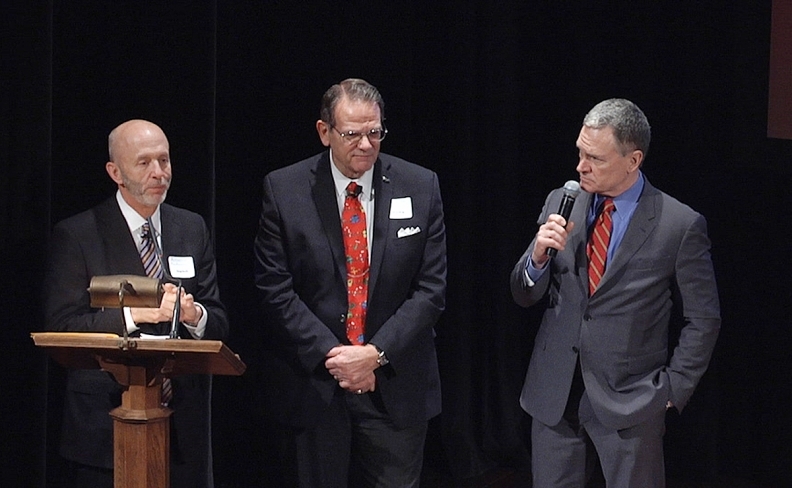 Left to right: Doug North, chairman of the 2020 NAIAS; Bill Golling, chairman of the 2019 NAIAS; and Rod Alberts, head of the Detroit Auto Dealers Association. DETROIT -- The Detroit auto show, seeking to reinvent itself following decades as a January venue, has committed to seven years with its new June date. The Detroit Auto Dealers Association has signed a deal with Detroit's Cobo Center to hold the North American International Auto Show in June through 2026, DADA officials said Friday. In July, the dealer group announced the move to June, following the decisions by automakers including BMW and Mercedes-Benz to skip the 2019 show. They were the latest in a stream of departees from recent years. Along with the June date will come a compressed schedule in the days leading up to the show's opening to the public. Instead of two media days and two days reserved for suppliers and other industry professionals, there will now be three preview days, DADA officials told the Automotive Press Association. In 2020, the primary media day will be Tuesday, June 9. The next day will be a split media/industry day, and Thursday, June 11, will be the exclusive industry day. The public show that year will start on Saturday, June 13, and end the following Saturday, a day earlier than what has been the norm. Ford dealer Doug North, chairman of the 2020 show, said the trimmed schedule will help lower costs and boost returns on investment. He said eliminating the last Sunday as a show date will also allow the city to prepare for that year’s annual fireworks display in downtown Detroit, scheduled for Monday, June 22. Bill Golling, chairman of the 2019 show, said media attendees at next month’s event can expect about 30 product reveals, including the Toyota Supra and Ford Mustang Shelby GT500. An affiliated mobility showcase called AutoMobili-D will return for its third year. Rod Alberts, executive director of the DADA, said he expects more technology companies to be integrated into the 2020 show, including the likes of Google and Facebook. He also said a late-spring showcase will allow for events and exhibits to spill out from Cobo Center into nearby outdoor venues.